You likely joined Supplier-Connection to help grow your business by winning major contracts and building relationships with the Fortune 500 partners. 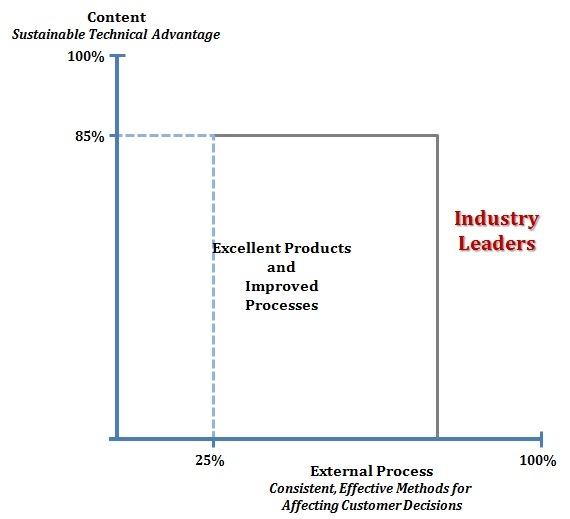 Richard Hodapp, the creator of a business process called Decision MAPping® says SBEs stay small because they don’t have a best-practice, a process for understanding and affecting their customers’ decisions, severely limiting their win rate to about 2 out of every 10 opportunities for new business. And with almost 40 years of watching small clients become huge (like FedEx)—he knows a bit about the benefits of having Decision MAPping integrated into an organization’s business practices. In short, Decision MAPping is successful because it strengthens and develops the critical core process of Decision Making, the output of this process being a map of how to position your company at the strategic level of your customers—in order to make strategic decisions with your customers. When you engage your customers at this level, you participate in affecting their decisions, dramatically increasing your win-rate. Don’t miss the link at the end of this blog to an audio interview I did with Rich Hodapp. I heard about Decision MAPping from a consultant we hired in late 1994, who used MAPping to grow the GE turbine engine group from $300M to $2 billion in sales. At the time, I was President/CEO of VSI Communications Group, a Marketing Communications company and early adopter of interactive multimedia for content development. And, we were launching Mentor®—a new multimedia tool that enabled users to master software without taking a training course. I thought MAPping might give us a strategic edge. Plain and simple: Rich Hodapp is an out-of-the-box thinker. My first conversation with Rich was like a WWE tag-team match: me vs. Ben Stein, Jon Stewart and that odd curly-haired professor from TV’s “Numb3rs.” He threw so many concepts and questions at me challenging my base understanding; I didn’t know what hit me! “Danny, we work with small to large organizations—from building maintenance to complex aerospace systems. The key is understanding how your customers make decisions—regardless of what product/service you’re offering—and because MAPping is so effective it can become a significant competitive advantage. “About 85%”, I answered confidently. “Okay, I’ll accept that.” He said. (I was thinking 25%, but didn’t want to admit it.) “Much, much lower,” I said. At this point I was shell-shocked because our overall win rate was just north of 20%. “No way… How could those numbers predict that! ?” I asked. This was a real tough pill to swallow since we invested so much money to improve our technical competency with little impact on sales growth. I felt he was wrapping up the call, but he squeezed in one last tidbit. 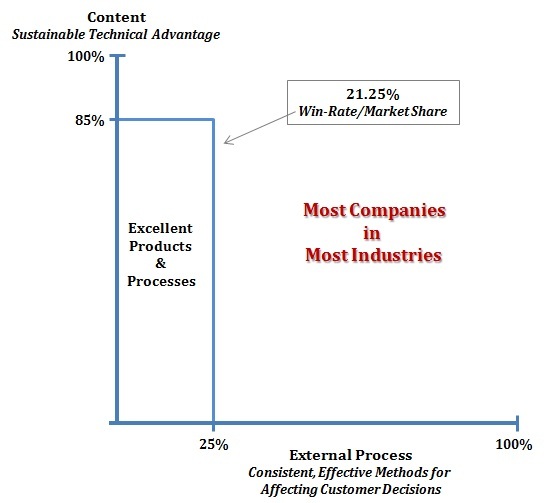 “GE did a study: their sales efforts using traditional selling methods had a win rate of 24%, but with MAPping the win-rate was 78%. Which do you want?” The answer was obvious. I got it, and we ran with it. Based on the MAP we developed, we’d stop selling Mentor to the Training/eLearning department because they were invested in course-ware. Instead we’d focus on the CIO, CTO, and CFO because they feel the most pain over new software deployments, own the budgets and deployment decisions, and that’s where we’d find the most innovators and early-adopters. In order to affect that higher scope decision, we’d need to change our entire sales approach—including the people we sent to meetings, the words we used—and we’d have to re-invent our marketing materials to communicate at this higher level. By late fall 1996, based on the findings from MAPping the market in early 1995, we won four deals to produce a Mentor for custom software applications for KPMG/Peat Marwick, IBM, Ernst & Young and McKinsey & Co.—all high profile customers. Each contract happened to be for a Knowledge Management System—a new, innovative solution being championed by corporate CIOs/CTOs in the mid-90’s. Everywhere Mentor went, Help Desk calls dropped 30-40%, while we simultaneously eliminated training expenses with our “just-in-time” delivery of knowledge. Consistent with the MAP, we needed tools that would communicate to CFO’s & CTO’s. Bob Smith, our EVP/COO, felt we could quantify the savings for the C-suite executives, and built an elaborate and supportable ROI spreadsheet that turned into the best sales tool we ever had. While onsite during the IBM project, our Project Manager heard IBM was in the midst of an enterprise deployment of Lotus Notes. When that news got to me, I scheduled a MAPping session with our PM, our Lotus Notes developer, and Bob. We’d been looking to productize our custom Mentor solution, and Bob felt Lotus Notes was the perfect opportunity—as Notes was in its early stages of market acceptance. A Mentor for Lotus Notes could be a big winner. In the MAPping session, we determined an IBM order to build a Mentor for their Lotus Notes deployment was priority #1. With a bit of research (pre-internet days!! ), we learned IBM acquired Lotus Software and would put a big push on selling Lotus Notes. Priority #2: we wanted IBM as a distribution channel for our first product: Mentor for Lotus Notes. Now, that’s what we wanted. But what did IBM need and what decisions must we affect in order to meet their objectives? After taking our IBM contacts through the MAPping process, it was clear that 1) IBM wanted their Notes roll-out done with minimal disruption to daily workflow—and that wasn’t happening. 2) They wanted to do it as quickly as possible to minimize the cost of running dual systems—that wasn’t happening either. (Most employees stayed on their old green-screen email system.) And, 3) they wanted to keep user assimilation costs from spiraling out of control by limiting Help Desk calls, which are the most expensive way to solve end-user proficiency problems. The MAP made it clear this was a high scope decision, and we were getting in late in the decision cycle. Their deployment was about 75% completed. The MAP showed I’d need to meet with the corporate CTO or CFO along with the message I’d need to deliver to get them to re-evaluate the decisions they were implementing. Our contact then helped arrange a meeting with IBM’s CFO in late-November 1996, and I delivered the Mentor value proposition. The CFO was impressed and committed to have some experts look over our approach, and the ROI analysis. We gave him everything he requested, including connecting our CTO with their technical evaluator. In January 1997, IBM’s CEO, Lou Gerstner, sent a company-wide email to their newly minted Lotus Notes email addresses, requesting an RSVP. Only about 17K of 400K employees responded. Within 30 days I negotiated a contract to build a custom Mentor for IBM’s deployment of Notes, AND an agreement for IBM to sell Mentor for Lotus Notes to their customers. With IBM as an anchor account, we were off to the races. (Mentor spawned a new learning category, now called Electronic Performance Support Systems.) We sold over 8 million licenses of Mentor for Lotus Notes, over 6M licenses of other Mentor products, and built custom Mentors for over 50 million users worldwide. Decision MAPping changed the way I ran my business as we focused our efforts on our external processes, developing sales campaigns based on our Customer’s strategies, leveraging the knowledge of cross-functional teams, and fully trusting the patterns MAPping sessions revealed. As a result of using Decision MAPping we grew Mentor from a $200K concept in 1995 to an $8.3M established business by year-end 2000—and why I view Decision MAPping as a real strategic advantage—especially important when selling into the Fortune 500. A few months ago I got back in touch with Rich Hodapp. His organization, The Mapping Alliance, and Decision MAPping have evolved, and MAPping is being used in a growing number of organizations, including the Pentagon and the European Union. Rich still most enjoys working with small organizations who serve an account based market—and he is such an engaging guy—I decided it’d be a waste to only write about him. So, as a special bonus, I recorded an interview for Supplier-Connection registered SBEs. I found the conversation so full of valuable content we went well past an hour. After editing it down, I split the conversation into two parts. Part 1 (about 25 minutes) covers the history of Decision MAPping, including important applications to SBEs. Part 2 contains valuable business anecdotes and case examples (27 minutes). Subscribe to this blog and you’ll get instant notification when the podcast goes live. Or, just check back in to The SBE Lifer blog. In the 1970’s Richard Hodapp was intrigued by how businesses developed winning strategies. After dissecting case studies on the leaders of American finance and industry, he zeroed in on a dominant principle: It’s not advancement of internal business decisions that make or break entrepreneurial success but the external decisions of customers. Businesses not only have to create useful products; it’s essential their customers decide to buy them. Likewise, government leaders not only have to create good policies, they have to get them adopted. Decision MAPping is a tool to analyze the customer’s decision making process, e.g. what decisions customers make and how they make them. Over the past 40 years, leading companies such as GE and Procter & Gamble, and top government entities including the UN, Pentagon & European Union, have successfully incorporated Hodapp’s ideas to gain the edge on their business competitors and foreign policy rivals.